Part of Adult Spiritual Formation involves responding practically to the Love of Neighbor that Christ commands and exemplifies throughout his public ministry. While our beliefs remain an intellectual insurance policy whereby we hope to save our skins from a just God, our religion remains a stagnant and self-referential idol. When the Lawyer asks Jesus, "What must I do to inherit Eternal Life," Jesus responds with the parable of the Good Samaritan, which concludes, "Go and do likewise" (see Luke 10). Taking responsibility for the sin, brokenness, and suffering of the world is not a suggestion: it is the Way and the Truth that lead to Life. The adult who is becoming spiritually formed will find him or herself in possession of the power and love to forego turning a blind eye on injustice, poverty, the misuse of the natural world for profit, and the lonely isolation of people everywhere. Prayer is an integral part of the journey of faith. Without opening ourselves to the power and presence of the Divine Being, we forego the promptings of the Holy Spirit. Without an intentional prayer life, we do not receive the sanctifying grace of that leads along the Way that leads to Life Eternal. Prayer is to the human spirit what air is to the human lung: a vital necessity. Many people are afraid to read the scriptures, either because they think they will not understand what they read, or because they expect that they will not like what they read. While both may turn out to be true, no person can be spiritually formed as a disciple of Jesus Christ without an intentional engagement with the Word of God. It is important to say, however, that while the Bible has been taken "face value" by Western Christians for the last 1500 years, this mode of interpretation can no longer be considered faithful. As Americans, we have lived our entire history under the misguided notion that if something is true, it must also be self-evident. This might have been useful when the Colonies need to escape the overbearing and unfair rule of the British Monarch, but the application of this premise to scripture is a disaster: we wind up with a religion that is incompatible with our lived experience and a God who is confined to what human beings have managed to convey within the limitations of language. 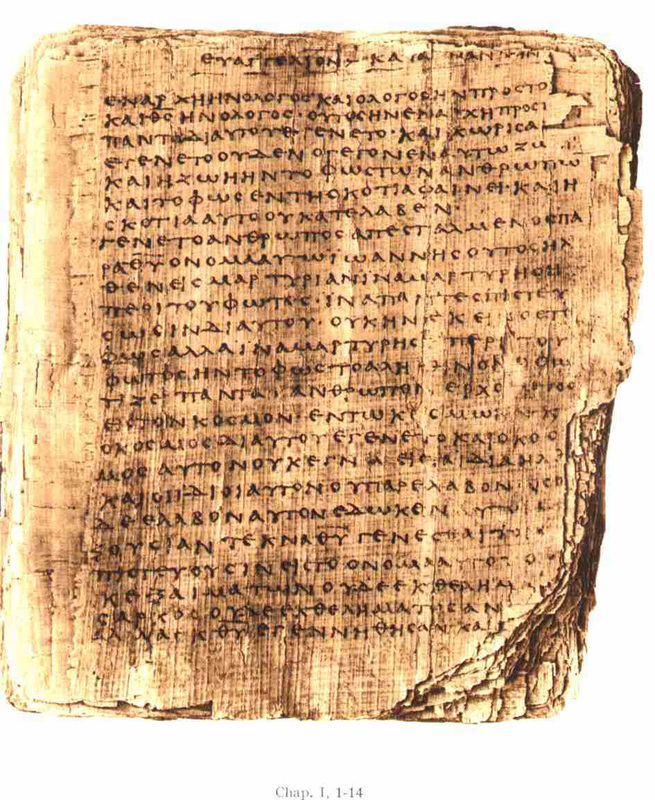 Not only this, but the cultures in which the scriptures arose, like the Greek Gospel of John pictured here, remain shrouded in mystery across thousands of years. If God exists, and if the primary revelation of God is the person of Jesus Christ, then we must say that we do not worship the scriptures, but the Triune God to whom the scriptures point. This means that God reveals God's self, and the scriptures are the human attempt to narrate the experience of that revelation. We call the Bible "holy" because our experience convinces us that the mystery and character of God is contained within its pages. In the stories of Israel, Jesus Christ, and the Church, God's love for and life with creation is revealed; and - by the power of the Holy Spirit - the Truth of God's commandments and promises becomes part of our lived experience. We read the Holy Scriptures with this in mind: the Good News about Jesus Christ and the redemption of creation can never be fully explained, but they can be fully experienced. To this end, we offer an adult bible study on Wednesdays at noon in the Education Bldg. In prayerful humility, we seek to hear what God is saying to the Church.